The coolest kinds of pilots are the ones who constantly wear sunglasses. Flip on the shades and bust through the villain's headquarters to retrieve the hostages and get them topside to safety. 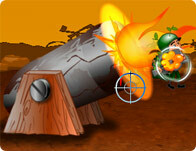 Dodge the turrets' fire and destroy the drones and tanks before they turn your ship into metal slag. Use the Arrow Keys to move. Use C to shoot. Use V to drop a bomb.